Faly grew up in a village in Madagascar. At the age of twelve he left his parents to pursue his secondary education in the capital, which he experienced as a culture shock. He thought that his home village should also have a secondary school, so that more children would be able to afford further education and could stay with their families during that time. 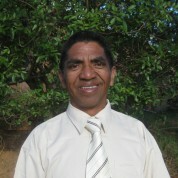 In 1993, he started his own school in Antananarivo with 23 students. Lycée Privé Mpanefa Iraka has now gained a reputation and grown to over 500 students and 27 teachers – with Faly even selling his inheritance to ensure its success. Witnessing alcoholism, teenage pregnancies and violence in a poor community, Faly realised that he needed to reach his students’ spirit, body and soul and gain the support of their parents. He believes that societal problems can only be solved through a holistic education that develops character and encourages children to become self-motivated learners. Faly’s teaching approach is based on the application of all content to students’ daily life. He complements lessons with enriching activities outside the classroom. On full moon nights (the community has no connection to the electricity grid) he invites students to perform poems, songs and dances and share stories. For the less artistically inclined he organises workshops for making roof tiles, preparing jams and learning how to generate electricity from wind power.